Over the past 12 years, The McKee Project/McKee Foundation has developed and taught spay and neuter techniques to 650 plus veterinarians in 8 Latin American countries. The reason McKee believes this teaching is critical is that the majority of veterinary schools in Latin America do not teach how to spay and neuter companion animals, as they do not believe it is a commercially viable practice and more importantly, a humane strategy to control overpopulation. Traditionally veterinarians in Latin America are trained for agricultural animals or for food supply safety. Veterinary care for dogs and cats is not even a consideration. The McKee Spay Technique takes minutes, utilizing a spay hook, and makes incision of about one inch – this is less invasive procedure, quicker, less traumatic to the animal, and approximately 60% more cost-effective. This quicker & less invasive technique allows countries to provide service to the thousands or millions of animals on the street much more efficiently. The result of McKee Project’s training has in the fact created a cultural shift where veterinarians are shown that spay and neuter of companion animals can be commercially viable by the creation of a new client base of dog and cat owners, as well as creating a new relationship between owners and their healthier pets. Besides spay neuter training for vets and their communities, McKee believes that pet “owners” need to be trained to invest in their animals as well. There is a cost associated with spay and neuter of companion animals, based on each veterinarians cost & owner’s ability to pay. Initially assessed by owner resources, the cost is minimal. Thus Mckee has a big job if we are to make a difference. Through your donations we can ensure this slow & culturally altering educational and training process happens in volume across Latin America, that it impacts the suffering of animals that are abandoned and abused from lack of housing, food, water, and companionship of humans. 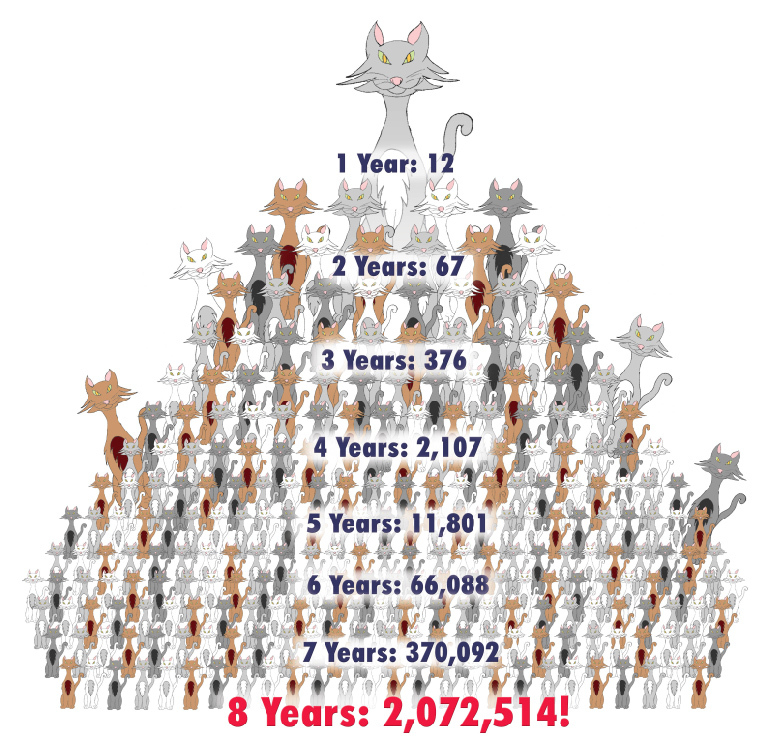 Below there are statistics from SpayUSA.org in regards to spay and neuter in your community, below that is a pyramid to show you how fast cats and dogs can multiple their numbers if left unchecked. In an “ideal” situation where food and water are present, and there is the right amount of space, 12 cats can turn into over 2,000,000 cats in under 10 years. Which of course is totally unsustainable and unrealistic for a community to deal with. -It helps to reduce companion animal overpopulation. Most countries have a surplus of companion animals and are forced to euthanize or disregard their great suffering. The surplus is in the millions in the United States. Cats are 45 times as prolific, and dogs 15 times as prolific, as humans. They do not need our help to expand their numbers; they need our help to reduce their numbers until there are good homes for them all. -Sterilization of your cat or dog will increase his/her chance of a longer and healthier life. Altering your canine friend will increase his life an average of 1 to 3 years, felines, 3 to 5 years. Altered animals have a very low to no risk of mammary gland tumors/cancer, prostate cancer, perianal tumors, pyometria, and uterine, ovarian and testicular cancers. -Sterilizing your cat/dog makes him/her a better pet, reducing his/her urge to roam and decreasing the risk of contracting diseases or getting hurt as they roam. Surveys indicate that as many as 85% of dogs hit by cars are unaltered. Intact male cats living outside have been shown to live on average less than two years. Feline Immunodeficiency Syndrome is spread by bites and intact cats fight a great deal more than altered cats. -Your community will also benefit. Unwanted animals are becoming a very real concern in many places. 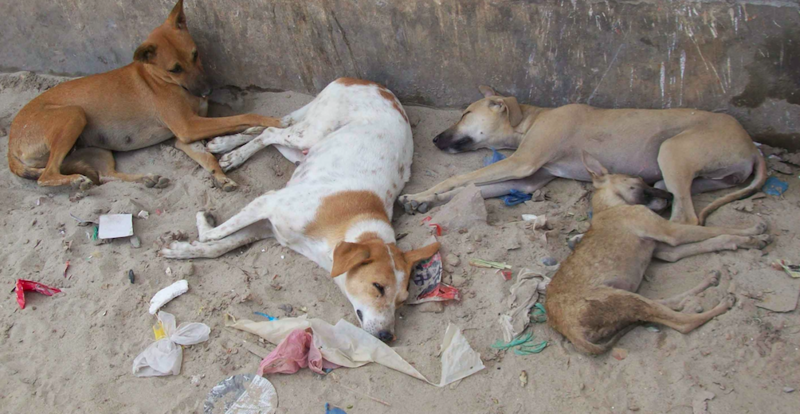 Stray animals can easily become a public nuisance, soiling parks and streets, ruining shrubbery, frightening children and elderly people, creating noise and other disturbances, causing automobile accidents, and sometimes even killing livestock or other pets. -The capture, impoundment and eventual destruction of unwanted animals costs taxpayers and private humanitarian agencies over a billion dollars each year. As a potential source of rabies and other less serious diseases, they can be a public health hazard.